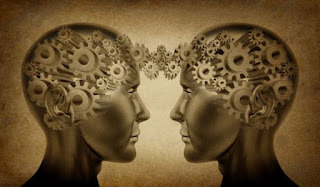 Today I'm a part of SF Signal's weekly "Mind Meld" topic, which is "The Translated Books We Love and Why We Love Them." My pick comes from the list of "Books that blow me away" at left. Read about it and other writers' favorite translated works here. I've received my programming schedule for FenCon, which takes place in Irving, Texas (Dallas-Fort Worth area) this weekend on September 25-27, 2015. I highly recommend this convention as one of the best regional cons I've ever been to. Click here for more information. Saturday 11:00 AM - Trinity VI - "My Other Job"
Saturday 6:00 PM - Chinaberry - "The World of FenCraft"
Sunday 10:00 AM - Irving Lecture Hall - "Warp Drives and Pointed Ears: the Upcoming 50th Anniversary of Star Trek"
Sunday 11:00 AM - Elm - "Artist Trading Cards"
This isn't quite a review ... not just yet ... but rather a reminder that the world premiere of HGOco's "O Columbia" is less than a week away! If you live in the Houston area, it would be a real shame to miss this -- there are only two performances, and tickets are only $20 each. As a reminder, HGOco is a branch of Houston Grand Opera. "O Columbia" is their commissioned chamber opera (~70 minutes long) celebrating the spirit of exploration that is such an integral part of Houston. In particular, it honors that spirit not only by remembering past explorers, including the crew of the space shuttle Columbia, but also imagining future explorers as well. Paul and I have been fortunate enough to have witnessed this opera from concept to realization. 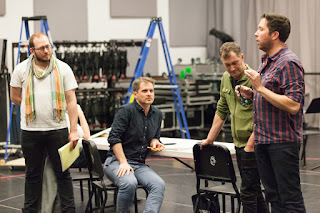 Over the last year and a half, we participated in two workshops that occurred during the work's development, one for the libretto written by Royce Vavrek, and one pairing that libretto to composer Gregory Spears' original music. And today I saw their sneak preview at NASA Johnson Space Center, during which they performed several highlights. Back when we first learned of this project, it seemed like it would be forever before it would finally premiere. Now, I can't believe it's already here! What I'm most excited about is seeing it actually staged. It will be performed at the Revention Music Center (formerly the Bayou Music Center), which is a big warehouse-like space. All of the performers will be "on stage" for the entire opera, but they're not going to be so much on stage as right in the middle of the crowd: it will be performed in the round, with moving ladders and set pieces and stars overhead. The preview today was fantastic; I can only imagine how much fuller the experience will be in this unique setting. I happen to have a lot of nieces and nephews on my husband's side. Since I'm fairly sure these kids have no shortage of toys, and I love excuses to read children's books, I decided early on that I would stick with giving them books as gifts. I dread the day that the youngest outgrows picture books, because they're the most fun to buy, but fortunately some picture books are sophisticated enough that you can go right on buying them up through age eight or even higher. Picture book biographies are especially good for this, because the "story" and vocabularies are often more involved, plus the child has the opportunity to pursue the subject further if they're interested. And even if they don't pursue it right away, maybe someday they'll remember/realize that that book they read as a kid was actually about a real person. My most striking memory of coming across a picture book biography as an adult was while I was in library school, taking a course in Children's Literature. 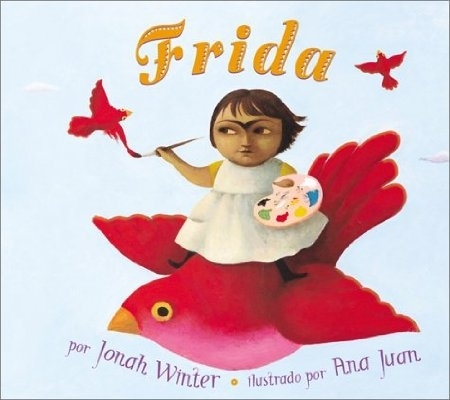 Our assignments required us to do a lot of research as to what was available out there for kids, and I found Frida, written by Jonah Winter and illustrated by Ana Juan. Just look at that cover! It's as though a very young Frida Kahlo was illustrating her own life, before her style solidified into the one we know today. This book was published in 2002, the same year the movie starring Salma Hayek was released. Obviously, art historians and collectors will have long known Frida Kahlo's work, but for me it took these nudges in more popular culture media to make me aware of Kahlo, and I'm glad it happened. 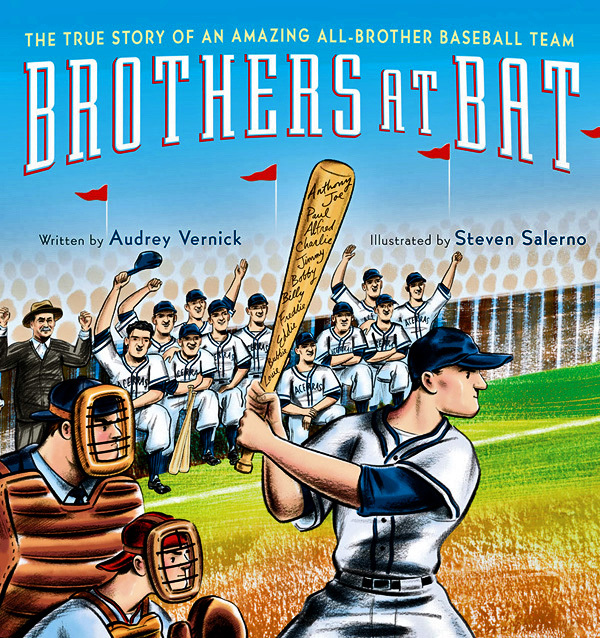 Another picture book biography that I only just came across is the wonderful Brothers at Bat, written by Audrey Vernick and illustrated by Steven Salerno, about an all-brother baseball team that competed for years, interrupted only by World War II. The Acerra family had sixteen kids, twelve of them boys, which was more than enough to field their own team. The book relates their story in a conversational style, all the way up through their last game as a team in 1952 and their honoring in 1997 by the Baseball Hall of Fame. 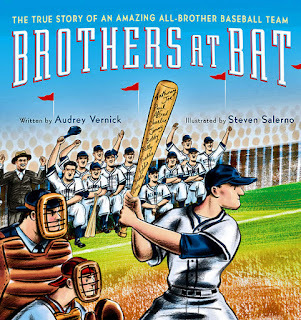 What's really interesting to me is that the Acerras were one of twenty-nine baseball teams made up entirely of brothers that played between the 1860s and 1940s. This brought home two things to me: first, that people sure did have a lot of kids back then, and second, that baseball really is the American game. (It's also more "mystical" than other sports, which to me is why baseball movies often introduce a hint of magic, whereas football and ice hockey movies are almost always about sheer force of will.) But back to this book: the illustrations have lovely attention to detail, so it's worth looking at them closely. 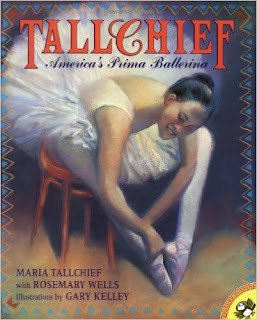 Yet another children's book that taught me something I didn't know: Tallchief: America's Prima Ballerina. This one is actually a picture book autobiography, written by Maria Tallchief herself with assistance from Rosemary Wells, and illustrated by Gary Kelley. Ms. Tallchief was considered the first prima ballerina, and the first Native American to achieve international ballet stardom; in fact, she was the first star of George Balanchine's New York City Ballet company. Since I didn't come to appreciate ballet until my late thirties, I know little about the history of the art form, so I was glad to find out about this influential dancer. Houston Ballet Dance Talk - "Discover Manon"
Originally I intended to wait until after I'd actually seen Houston Ballet's Manon before I would write about the dance talk pertaining to this production, but the talk, which I attended last night, was so outstanding that it deserves mention all on its own. By way of background, the Houston Ballet puts on several dance talks each season that are free and open to the public; these may feature the company's Artistic Director (Stanton Welch), ballet historians, dance and/or literary scholars, conductors, dance teachers, and, of course, dancers. The talks are held on weekday evenings, usually leading into a specific production, and are about an hour long. They take place at the Houston Ballet Center for Dance, which is the fairly new and quite gorgeous rehearsal space for the company, located on Preston Street in downtown Houston. Last night's talk served as an introduction for the season's opening production of Manon, a three-act ballet created by choreographer Sir Kenneth MacMillan in 1974; it is set to music by Jules Massenet and based on the 1731 novel by Abbé Prévost titled L'Histoire du chevalier des Grieux et de Manon Lescaut. Rather than a lecture, the talk consisted of a panel discussion led by Elizabeth Klett, a professor of Literature at UH-Clear Lake whom we saw speak last year on interpretations of Shakespeare in ballet. For this talk, she was joined by Assistant Conductor Ned Battista and répétiteur (*) Bruce Sansom -- a terrific combination, because between them they could speak authoritatively on the literature, music, and movement of Manon. Dr. Klett began with some background on the novel, which she points out has not one but two title characters: des Grieux and Manon. The multi-part work was considered quite racy at the time due to Manon's questionable morals. Dr. Klett also referenced a June 2006 New York Times article about three different dancers' interpretations of the character, who transforms from innocent girl to celebrated courtesan to impoverished prostitute over the course of the ballet. Dr. Klett then invited Ned Battista to speak to the music, which was particularly fascinating. Although Jules Massenet (1842-1912) had composed an entire five-act opera for Manon, which was first performed in 1884, MacMillan decided he wanted to use different music -- but by the same composer -- for the ballet. As a result, every note of the ballet's composite score was written by Massenet, but not one note of it came from Massenet's opera. Instead, MacMillan hired musicians to comb through Massenet's catalog of work to find pieces of music to fit the ballet he envisioned, a difficult task considering that the pieces needed to sound organically cohesive. This provided a segue for Dr. Klett to ask Mr. Sansom about similar motifs in the choreography, and he explained that Manon repeats, once in each act, the same sequence of steps yet with different interpretations depending upon her circumstances at the time (innocent girl, celebrated courtesan, and somewhat enfeebled prostitute). He also spoke about his own experiences dancing in this ballet, having performed many of its roles, including that of des Grieux. The talk ended with questions from the audience; my favorite was when a woman asked Mr. Battista about working with dancers as opposed to singers. He answered that the conductor does have to watching the dancers closely, stating (more colorfully than this) that if the dancer is a little bit behind tempo, you have to pull up and not let them (or make them) crash. I loved the answer because it showed how strongly he felt that it's a give and take process, and they're all there to work with each other. Rigid adherence to having one's own way, he said, is not the way to make art. Houston Ballet's Manon will run from September 10-20, 2015.